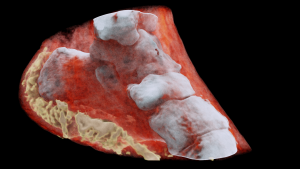 New Zealand based, Mars Imaging has released their color 3D CT-scanner that uses technology based on CERN technology developed in the search for the God particle at the Large Hadron Collider in Switzerland. The new scanner was developed by Professors Phil and Anthony Butler from Canterbury and Otago Universities in New Zealand. Professors Butler are father and son, scientists, and creators of the new medial scanner. They’ve been working on this new scanner for the past ten years, and just now they’ve captured and shared the first (public) images of the insides of a human body scanned in color. Read more ….